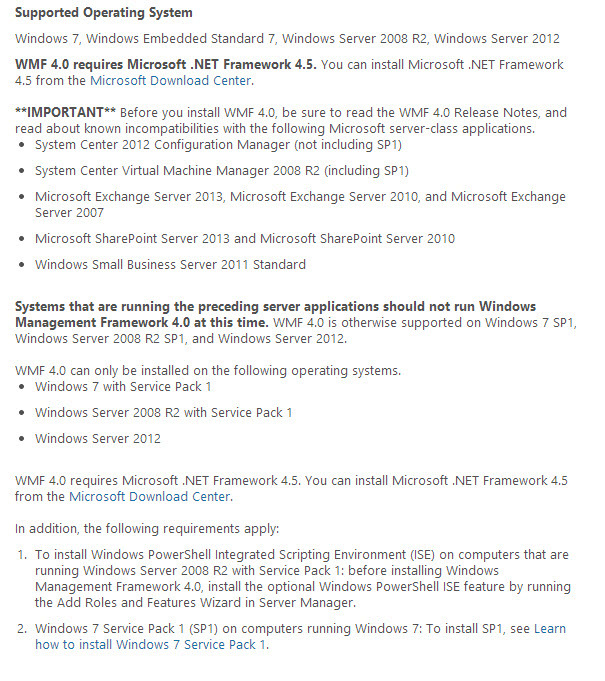 Just a heads up that the Windows Management Framework version 4.0 has been released. If you remember the past year or so that it wasn’t until Service Pack 2 was released for SharePoint 2010 that you were able to use Windows Management Framework 3.0 with the application server. In similar fashion, version 4 is not compatible with a boat load of applications (Exchange 2013, SharePoint 2013, SharePoint 2010). So before you get excited and run out and install it to start taking advantage of some of the improvements in Windows Remote Management, be mindful that it will break your applications.